Spaces aren't bound by proximity. The advantage of spaces is rooted less in their nongeographical virtuality and more in their unlimited ability to absorb connections and relationships. By means of communications, network spaces can connect all kinds of nodes, dimensions, relationships, and interactions--not just those physically close to one another. The popular suffix of "space" is a truncated version of cyberspace, a science fiction term for an immersive electronic space. But the roots of the term are deeper. The technical concept of "space" came out of mathematics and computer science. Space is one way scientists describe complex systems; very complex spaces have their own unique dynamics. The notation of space is particularly handy when describing the ordinarily vague and indefinite form of networks. The net, as it encompasses billions of objects and agents (there are already more than 100,000 cameras on the net), operates in what mathematicians call "very high dimensions," and has correspondingly novel dynamics. As electronic mediated environments expand, place has less influence and complex space more. As the economy infiltrates each network medium, it trades a physical marketplace for a conceptual marketspace. 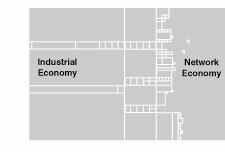 The industrial economy made it impossible to live next door to the source of all the goods consumers desired. If you wanted bananas, many intermediaries had to handle the fruit between the plantation in Honduras and your kitchen. Between the author of a book and you there needed to be a chain of editors, bankers, printers, distributors, wholesalers, and booksellers. Between you and good health care were doctors, nurses, insurance behemoths, and hospital staff. Between you and the car of your dreams stood a line of miners, smelters, engineers, manufacturers, railroad yards, showrooms, and salesmen. Each one of these agents moved the good or service along; some by completing the product (the car engineer) or customizing the service (the hospital staff), and some simply by physically moving it toward you (the banana boat). In business theory this line came to be known as the value chain. Each intermediate link in the long chain of creation added some measure of extra value, justifying the cost the link added to the good's final price. Companies competed to insert themselves into a value chain, then to expand their control of greater lengths of the chain. One of the very first noticeable effects of computers and networked communications was the alarming way they disrupted traditional value chains. Futurist Paul Saffo calls the multiple interactions needed to survive in the new economy a move "from value chain to value web." ...one of the very first commercial web sites in 1993, the phrase "unlimited shelf space" was often used by potential contributors. Closely linked to this phrase was "bypassing the editor": the notion that editors were superfluous intermediaries, and that writers and readers didn't have to be subject to the frustrating and degrading filtering of go-betweeners. The raw stuff would flow in its full length and naked power directly from writer to reader. Our first prototypes convinced us that that wasn't how the net worked. The web site we launched and continue to build today (Wired Digital) is based on a different premise: that in a network economy, intermediaries have tremendous value. ...intermediaries follow. The more nodes, the more middlemen. Someday everyone in the world will have email, and when they do, I don't want six billion emails a day as everyone shares what's on their mind. Since half the world will probably have their own businesses, and half of those will be start-ups, I will do everything I can to insert intermediaries between my mailbox and their mailsenders, to sort out, route, and filter my incoming mail. By the same token when I go to email old Mohammed Jhang, someone whom I have not met, who lives in Chinese Turkestan, to let him know about my latest gene therapy cure for arthritis, I'll need an intermediary to find him and then to reach past his blocking filters. I probably won't get through so I'll need more intermediaries (An advertiser? A lottery? A locating agent?) to lure him into the open, perhaps a pigeon-racing club, or the cineplex where he gets his movies from, to make him aware of my discovery. Sure, anyone can type "new gene therapy cure for arthritis" and turn up 32,000 hits. But you need intermediaries to vouch for their medical worthiness. You need intermediaries to compare my price and the others. ...was the realm of the middle. The middle was once where everyone lived and most things happened. This size once flourished in geographical towns (with tens of thousands), ordinary communities (with thousands) and neighborhoods (with hundreds). Places embraced the middle very well. But the vitality of places was weakened by a bifurcating pressure to make things either huge for the masses or solo for the personal. The logic of the modern was: it must appeal to everyone, or to only me. Neither mass society nor the cult of the personal was equipped to deal with the peculiar dynamics of the middle. There was little economic or technological support for aiming an innovation at 5,000 people. Neither broadcast nor the personal chip, for example, really knew how to do towns and neighborhoods. The hard middle is a pervasive problem. We have tools to access the ideas in one person's book: its index and table of contents. We have tools to access the ideas of a library of millions of books: its card catalog. But we don't have tools to access ideas in the hard middle, the region of expertise in 10,000 scholars, or 1,000 books. Where do you go for a listing of key words, key subjects, and key ideas for the complete literature about the U.S. Civil War? Until recently, nowhere. Today, the symbol WWW immediately pops into our mind. We see in the World Wide Web the promise of creating a viable midlands. In this particular case the hyperlinking of all documents could be filtered and categorized to generate an index to middle-sized knowledge. Services and goods for previously ingnored community -- and town-sized groups, also known as the hard middle, can make economic sense with network technology. The electronic space encourages middle communities. Unlike either broadcast or PC chips, a network fosters the energy that flows from the friend of a friend to the friend of a friend. Network architecture can find, cultivate, persuade, manage, and nourish intermediate-sized audiences and communities focused on common interests. Niche markets, in other words. Magazines, rooted in the postal system network, have served niche markets for a century. But the emerging broadband network offers many relationships the postal network (and magazines) could not: spontaneous reply, fully symmetrical bandwidth, true peerage communication, archives, filtering, community memory, etc. ...the power of hobby tribes and informed peers. Amateurs, plugged into the net, discover comets, find fossils, and track bird migrations better than pros. By networking their interests and passing tips around, amateurs also create software in languages so new that they are taught in no classrooms. These self-organized communities, unleashed from their obscurity by the net, are the new authorities. Silent movie buffs and meteorite collectors are quickly gathering on the net because the net's space coheres them into a middle market, served at last by business and sales aimed directly at them. Egyptologists or cancer patients can create a mid-sized agora (neither insignificant nor huge) for ideas and knowledge. There was no place in mass markets for the niche communities of ethnic tribes or Klingon speakers, but the network economy constructs a space for them. But mass broadcast TV and big print publishing are not going away. The chief advantage of peerage networks--that information flows in ripples through a web of equal nodes--is also the chief weakness of networks. Information can only advance by indirect osmosis, passing along like gossip. The web becomes a thicket of obstacles preventing simultaneous dissemination to all parts.